A dental bridge is a way of filling any gaps left by missing teeth. If you have any such gaps, it is a good idea to consider a bridge; leaving gaps for too long could cause misalignment among your remaining teeth. They would drift from their correct positions to fill the gap. The big issue with bridges is how to anchor them in place. There are three types of dental bridges, each supported slightly differently. Traditional dental bridges – which are anchored by crowns on the two neighboring teeth. Even though the neighboring teeth are healthy, some of their enamel is removed to make room for the crown. Then the artificial tooth replacing your missing tooth is attached to them on each side. Cantilever dental bridges – which, as the name suggests, are anchored only on one side. When no tooth is present on one side of the gap (that is, it’s a back tooth that’s missing), the two teeth on the other side are given crowns and this provides extra strong support from that side to make up for the lack of support on the first side. Besides the three traditional ways of attaching a dental bridge, there is a fourth way which modern cosmetic dentists offer. That is supporting the bridge with a dental implant. This is the best way, because it not only replaces the missing tooth, but the missing tooth root as well. Our Oakton cosmetic dentistry practice believes that an educated patient is the best kind. 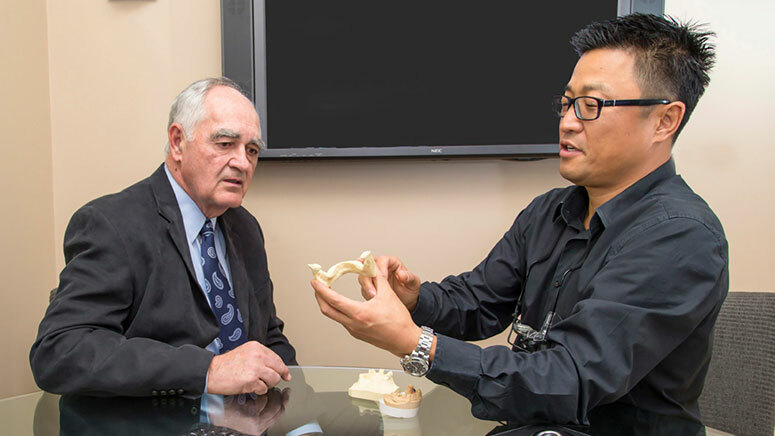 Please give us a call at 703-319-6990 or email Softouch Dental care if you would like to have a personal consultation about dental bridges with Dr. Michael Chung. We will be glad to answer your dental bridge questions and explain how the various procedures might benefit you. Our office serves Vienna, Oakton, Tysons Corner, Reston, Arlington, Fairfax, Washington D.C. and the Northern Virginia area.